Welcome to Orange Beach Fish! Call our office and speak with Marian, our professional booking agent and let her get you put on the list. 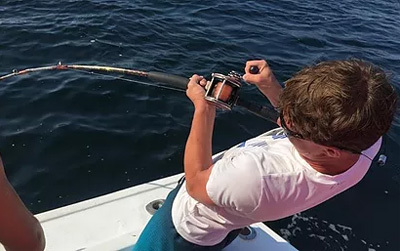 Discover the thrill and adventure that deep sea fishing on the abundant waters off of Orange Beach and Gulf Shores, Alabama. 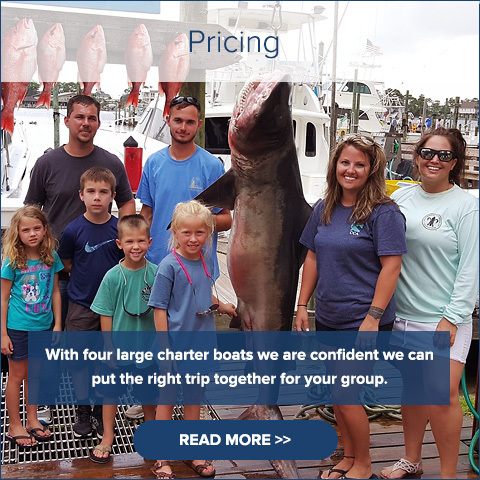 Go on a Gulf Shores fishing charter on the Alabama Gulf Coast with the our fishing team. With a lifetime of fishing experience, and thousands of private reefs on your side, your almost guaranteed a great catch. We specialize in customer service and a good time for your family and friends. 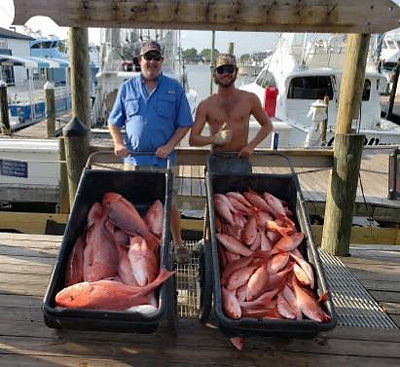 A relaxing Gulf Shores Vacation is not complete without deep sea fishing trip in Orange Beach fishing charters. With over 30 years of fishing experience, I have four charter boats that are located at ZEKES landing marina in Orange Beach, Alabama. We offer any type of Gulf Shores fishing but we specialize in family and friend groups and private charters. When you book your charter make sure you fish with someone that has the experience you expect. My family has been in the Charter fishing business since 1979 right here in Orange Beach, Alabama. If you're looking for a blood pumping, heart pounding, great time, you might be able to talk the deckhand into putting you down a shark line. We have special tackle equiped with 250 pound braid line just for the occasion. 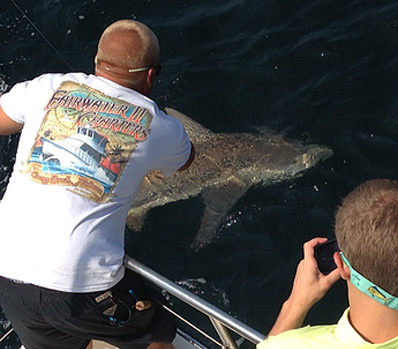 Shark fishing in Orange Beach is done while deep sea fishing on a 6 hour charter or longer. A 6 hour charter is a good start for someone wanting to try and catch a few fish for supper and possibly hook a big shark. Most of the sharks we catch in the waters near Orange Beach are Big Bull Sharks. You will always have a mate next to you coaching and helping, and believe me you will need the help. The Bull Sharks we catch, are usually close to 100 to 200 pounds with a big one going over 350! There is nothing like Shark Fishing in Orange Beach. If you would like to try and catch a big shark while deep sea fishing in Orange Beach, just let us know in advance. We will be ready to hook you up and have a fight of a lifetime. 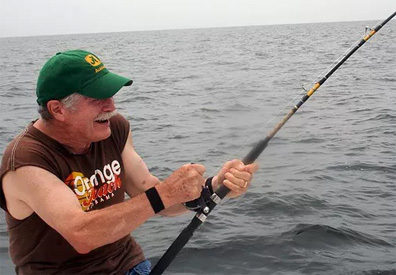 Everyone on the boat usually has a turn at battling one of these big fish. I have personaly seen everyone on the boat fight a single shark. We usually recommend at least a 6 hour fishing charter to target sharks. We are usually fishing for other fish while we shark fish so there is no boredom and plenty of action while we wait on the big bite. The fish we target range in variety. We practice conservation, so please let us know how many you want to keep and lets release the rest. We offer catch and release fishing, and most always take plenty back to the dock if you choose. 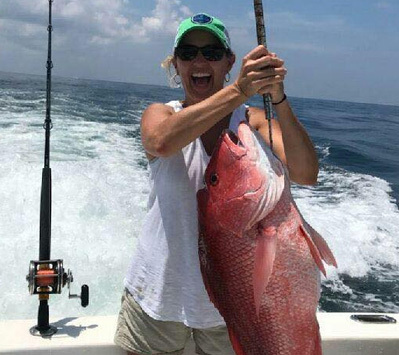 Bottomfishing includes fishing for red snapper, vermillion and white snapper, triggerfish, ,lane snapper, amberjack, grouper. Good chance to hook into a big shark. While trolling we catch king mackerel, Spanish mackerel, bonita, jack crevalle, bull redfish. You can do fresh catch at Wolf Bay Lodge located just minuites from the boat and enjoy what you just caught. Your deckhands will always provide first class service, or I will personally see that they walk the plank! 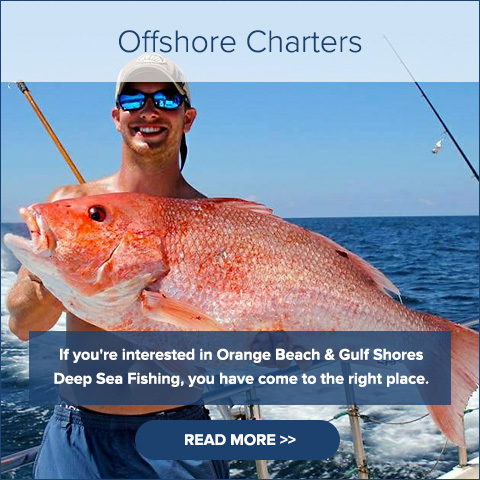 If you're interested in Orange Beach Fishing, or Gulf Shores Deep Sea Fishing, you have come to the right place. Hello, I am Captain Tom. Call me and lets set up a private fishing charter, where you have the whole boat to yourself. That is what we are all about, customized private service for you and your crew. More than likely you didn't ride on a bus to get to the beach, why fish on a boat that looks like a chartered bus? A boat overloaded with too many people trying to fish at the same time, a boat full of strangers that you do not know. Can you say tangles and missed opportunity? 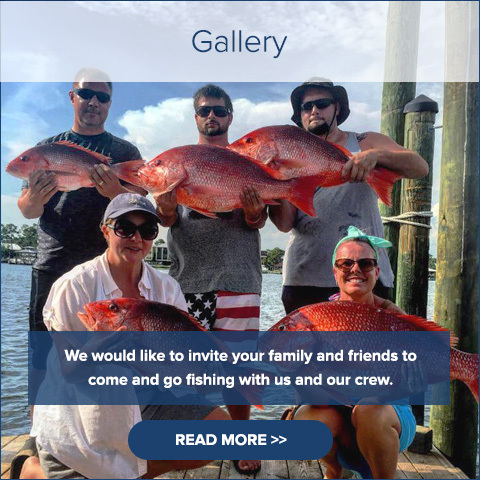 Book one of our very nice boats and fish with just your friends and family, where you have full control of the environment around you! 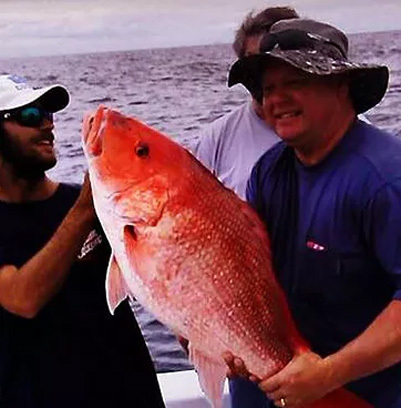 Come and totally enjoy your Gulf Shores Fishing Charter with us. 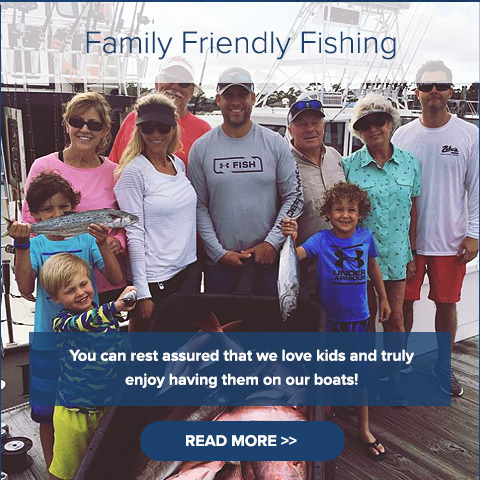 Gulf Shores Fishing Charters Specializes in Family Fun and Sport Fishing! We have a world class fishery at our fingertips just right off our shores. Due to very tough regulations guarding our fishery and our world class reef zone with more than 17,000 artificial reefs, we have one of the finest fisherys in the world. It is true we are not able due to regulation to kill nearly as many fish as we have in the past but due to this, our fishery has exploded with more fish that I have ever seen in my 30 years of fishing here. We constistantly harvest plenty of fish to eat on most all of our trips but what we bring back to the dock does not tell the story of the fishing trip in itself. Our customers have the ability to catch and release big amberjack and red snapper year round. Most of our trips we can actually wear you out fighting big fish. Its called sport fishing, having fun with light tackle and live bait, keeping what we need for eating and releasing the rest to fight another day. Why should you choose Fairwater II Charters for your Gulf Shores/ Orange Beach Fishing Vacation? We operate a safe boat and exceed US Coast Guard regulations with all of the latest safety equipment, the Fairwater II is certified for 18 people, and the Boll Weevil can comfortably fish 6. Our Captains and deckhands are professional, dependable, and very fun to be around. Your comfort on our boat is very important to us. If it gets too rough for you we will take you back in. All bait, license and tackle are furnished. We accept all credit cards, cash & checks. My family has been in business since 1980. Avoid the big crowded party boats with shoulder to shoulder strangers. 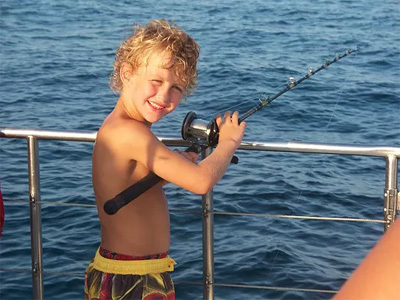 We provide a fun fishing environment on our boats, fishing with us is a good time for all ages. We cater to you & your group. Family fishing or seasoned anglers are all welcome. With two large charter boats to serve you, we can put the trip together no matter how large or small your group. Make sure to ask for our large group discount for groups over 15.